Fans of lovely Canadian plus-size model Justine Legault will be delighted to learn that she will be appearing on the cover of Elle magazine, published in her native Québec, in the May 2013 issue. I especially love Justine's look in the pink dress, as seen in the above thumbnail and from 0:56 onwards, which shows off her voluptuousness and suggests attractive fullness at her waist and hips. Even though I can't understand a word of it, there is something about a beautiful woman speaking French that is absolutely intoxicating. Is size celebration having a renaissance? Just hours after Katherine Roll releases a shoot that celebrates her opulent thighs, Elle Québec has posted Justine's cover for the May issue of the magazine. Not only is it extraordinary simply in the fact that the cover presents a plus-size model fronting a major, mainstream fashion magazine, but far from trying to present Mademoiselle Legault as a straight-size model and hiding her curviness, no, Elle boldly celebrates the most full-figured aspect of Justine's body: her luscious thighs. This is the most pro-curvy, most beautiful image Justine has ever shot. And it's a magazine cover! The magazine even retains a hint of dimpled flesh in the model's skin. This is akin to the kind of image that the Judgment of Paris would put on the cover of a magazine. I never imagined that a mainstream fashion publication would ever embrace size celebration so boldly. Finest magazine cover ever? I venture to say so. Incredible work by Justine. At last, a full-size version of Justine's remarkable cover has appeared online. It still staggers belief that such a size-celebratory image actually fronts a mainstream fashion magazine. It seems like a cover from an alternative reality, from a world in which the timeless ideal of full-figured beauty had never been suppressed over the past century, but was still enshrined as the epitome of feminine attractiveness. Too often, the fashion industry today remains manacled by a straight-size aesthetic when it shoots plus-size models, and absurdly attempts to hide and disguise their most visible curves. Yet somehow, incredibly, Elle Quebec managed to free itself entirely of this curve-o-phobic thinking when producing this cover, and instead adopted a completely size-positive point of view, by highlighting Justine's most undeniably (and beautifully) plus-looking features: her full, womanly thighs. The significance of this cannot be overstated. It would be like shooting a plus-size model with a full waist wearing a midriff-baring top, or shooting a plus-size model with generously proportioned arms in sleeveless apparel. Even test photographers seldom adopt such a size-celebratory approach (certainly full-figured fashion clients do not), so to see a magazine with the Elle banner surpass them all in pro-curviness is nothing short of astounding. The issue also gives Justine's pink-dress image a page of its own, and while the tear sheet is certainly attractive, the video footage embedded earlier in this thread still offers a better glimpse of the attractive fullness at the model's waist and hips. The abbreviated dress does, however, show off Mademoiselle Legault's gorgeous legs, which exhibit a lovely shape, free of unattractive muscle tone, instead softly formed by natural fullness. For those whose command of the French language is up to it, Elle also includes a brief interview with Justine in this issue. You may click this (or any of the images in the current post) to view at a larger, more readable size. Bravo to Elle Québec from what is surely the most size-positive cover ever to appear on any mainstream fashion magazine, a cover worthy of Mode itself. And kudos to Justine for this stellar triumph. Her aristocratic beauty is so remarkable that anyone who sees this cover will never again be able to deny the superior beauty of the plus-size model. On its Web site, Elle Quebec has now published a page with a backstage slideshow of the making of its historic cover. What's interesting is that the text reveals that there was no guarantee that the publication was going to produce such a size-celebratory cover. It shot Justine in a number of other looks -- all of which were attractive, but none nearly so pro-curvy as the cover choice. At the time of the shooting, there is not yet any outfit will be chosen for the cover. the team meets to make a preselection of images of the first look. Surely Elle must have realized right away what an exciting cover image it had on its hands! Caption for the above photo: "The pro at work." Caption for the above photo: "Using a light wind gives a lot of volume to the hair." Caption: "This time, [stylist] Jay Forest uses a fan to effect movement at the bottom of the dress." Caption: "Look#4 - the little white dress." Caption: "The spray of water a must for wet hair that keeps this look #5." Frankly, I think Elle should have published an editorial with pictures of all five looks. However, there's no question that it chose by FAR the best look, and photo, for its cover. Number 1 all the way! Other recent Elle covers with faux-plus models or celebrities failed, because the cover personages didn't look full-figured. In Elle Quebec's cover, Justine is unmistakably plus-size (and gorgeous), making it a perfect image. How thrilling! The Daily Mail, one of the two most-read newspapers in the U.K., just ran a story about Justine Legault's appearance on the cover of Elle Quebec. It comes with a splendid title ("The Thigh's the Limit!") and is an altogether positive and celebratory story. Plus-size models have been making strides in the fashion world recently, and now another has been chosen to grace the cover of a major, mainstream magazine. Justine Legault, 26, looks effortlessly chic as Elle Quebec's May 2013 cover girl, striking a pose in a white shirtdress, her blonde hair styled in natural waves. And rather than attempting to conceal her curves, the image celebrates the 5ft 9in, size 14 model's full-figured thighs, placing them front and center. 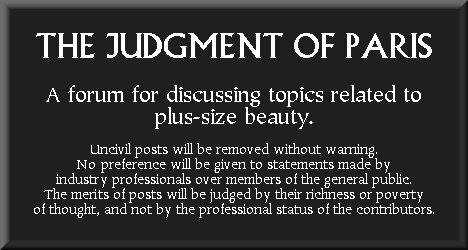 I LOVE the fact that just as readers did here at The Judgment of Paris, the reporter singles out for praise the fact that the cover image bares and celebrates the most full-figured aspect of Justine's figure, her luscious thighs. With her blonde locks, soft features and green eyes, Miss Legault, who has done fashion campaigns for Nordstrom, Macy's and Avenue, to name a few, exudes timeless beauty. In the interview with the magazine, the French-speaking model - whose dream was once working behind the camera - explains that she was discovered by chance at the age of 20 by an agency looking for a plus-size girl. 'At my first photo shoot, I remember hearing the photographer call my agent on the phone and say, "Oh my god! We've got something here!"' she said. And after her career began to take off, Miss Legault moved from Quebec to New York, where she now lives and is represented by Muse NYC. 'My beauty regime is similar to that of other models,' she explains, noting that her job means she has to take care of her skin and maintain her figure. 'Except that I love a good meal and I eat very well!' she adds. How amazing that Justine actually uttered that last phrase, openly delighting in the generous appetite which has given her her beauty. How positive a statement this is, one which young girls will read and, in so doing, learn to be comfortable with their natural appetite and eat whatever they wish, without any stigma. The reactions to Miss Legault's cover and spread have overwhelmingly positive, with fans praising her for embracing her womanly curves, as well as applauding the magazine's decision to choose her. And while some may criticize her or judge her solely on her appearance, Miss Legault says it doesn't faze her. 'How many times have people told me during an audition: "I don't like your hair, I don't like your teeth…?"' she says. Bravo, bravo, bravo to the Daily Mail for a 100% pro-curvy article, as celebratory as the cover on which it reports. And kudos to Mademoiselle Legault for delivering such utterly perfect answers to the reporter's questions, and for making statements as size-celebratory as her images. 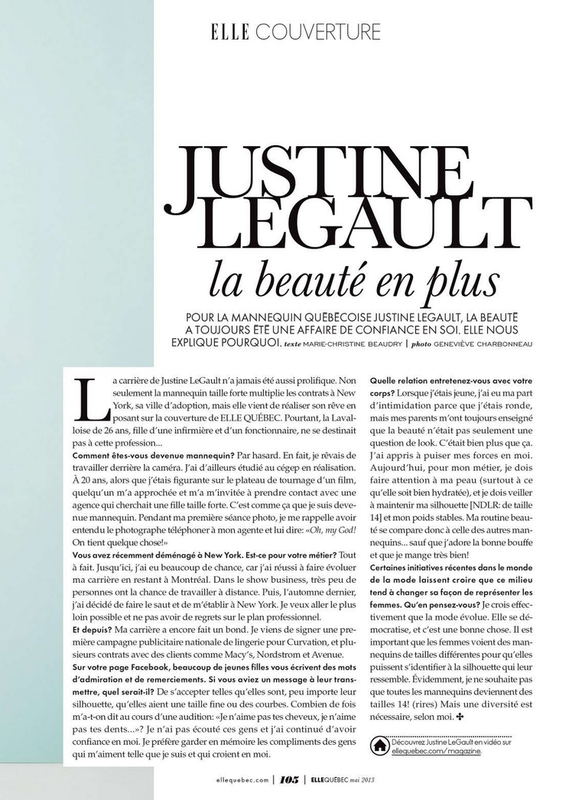 Justine's Elle Québec cover continues to attract press attention, which is a good thing in itself, but even better in the fact that the media coverage has been altogether uncommonly positive. There's just something about the cover that brings out favourable responses in even neutral writers; which just confirms a point that the Judgment of Paris has always made: that timeless beauty, as embodied in gorgeous and genuinely full-figured models (not faux-plus frauds and not "real women" homeliness), can prompt a revaluation of aesthetic values. The Huffington Post, for example, has published not just one but two pieces devoted to Justine's cover. Three cheers for Elle Quebec, who decided to give their readers a gift this month with an awesome new cover model. Justine LeGault, who poses for the May 2013 issue, is a plus-size model with gorgeous blonde hair and a size 14 bod, both of which she showcases on the lovely new fashion cover. Unlike so many mag covers featuring curvier women, Elle Quebec's shows Justine's whole body, with the camera angle tilted to highlight her bare thigh. As a self-declared "International Curvy Model," LeGault has nothing to hide -- and neither does Elle. The new issue has been highly praised by Internet commenters and editors, success that should indicate to other fashion editors that they have nothing to fear by featuring more shapely models. The second HuffPo writer is just as favourable. Elle Quebec certainly wasn't afraid to show off the blond beauty's curves. The cover photo features the 5'9 model's bare legs and thighs front and centre. If anything, an article from The Gloss is even more affirmative. Rather than hiding her legs under a tunic, or Photoshopping them into two little twigs, Elle put Ms. Legault’s thighs front and center, and even let them keep a tiny bit of dimpling. There’s no mistaking her leg for that of a straight size model. She stares straight into the camera, as if to let us know that she sees us seeing her leg and that she’s showing it to us on purpose, giving off an impression of confidence, which, in turn, makes her even more beautiful. The Fashion Spot, which runs a popular form for loves of underweight models and minus-size fashion, breaks new ground with a commendatory article of its own. Justine Legault is quickly taking the fashion world by storm with her 5'9" and a U.S. size 14/16 frame. But size aside, she's a real stunner with an admirable attitude to boot. Her pictorial has her suggestively flashing her thighs in a barely-there white shirt dress, blonde hair styled in natural waves, with a smouldering green-eyed stare popping from the page. Introducting Justine Legault, a French-Canadian model who is positively ravishing on this cover in a gauzy white shirtdress and flashing some thigh in an ever-so provocative manner. This is definitely progress. a size 12, so she didn’t really fit into the true “plus-size” spectrum, but as a model, she definitely qualified as opposed to the size 0 types who can barely walk down the runway because they haven’t eaten solid foods in days. Now here comes Justine, who is several inches shorter than Robyn at 5’9” and a size 14, and she’s quickly taking the modelling world by storm in her own way. Even writers in the non-plus press recognize that there is a significant different between having a faux-plus model penetrate the minus-size fashion world, and having a true plus-size model (size 14 and up) do the same. It's as if, in seeing Justine, the press is taking a second look at classical beauty (which they have suppressed and denounced for decades) and realizing, "Goodness, full-figured femininity is breathtakingly lovely after all, and the timeless ideal is superior to modernist androgyny."